We all love a good discount! Well, not always if you are on the giving end of it. Without a strategy, it's a gamble. You don't know if it's going to be a net-positive move. Not being afraid to tackle the difficult subjects, Jeff Matlow, CEO of imATHLETE, took on the topic of Discount Codes: What You're Doing Wrong in the fourth webinar in the Data Insight Series. It was held on November 7th in partnership with Running USA and was the most well-attended to date, setting a record as the most attended webinar in Running USA history. The topic generated a lot of interest and a lot of questions. We turned to our pool of 124m+ data points from imATHLETE on athletic consumerism, 500,000+ responses to an ongoing athlete survey by imATHLETE and reports from Running USA. We looked at how characteristics like race distance, participant travel distance, age and gender factor into the use of discount codes. 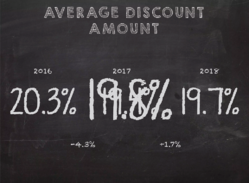 The average discount amount in 2018 was found to be 19.7%, up from 19.4% in 2017. 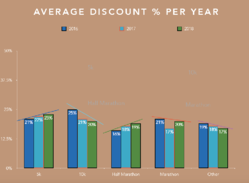 The distance with the highest average discount amount in 2018 was the 5k run, with an average of 23% discount amounts. Meanwhile the greatest three-year change has been in both the 10k (down from 25% average in 2016 to 20% in 2018) and the half marathon (up from 16% average in 2016 to 19% in 2018), both of which represent a 20% shift in trends. A more in-depth look at the impact of changes related to other variables showed how to create a meaningful discount code strategy. If done ineffectively, discount codes can be a fast track to lost revenue. However, by understanding the data and applying the learnings judiciously, discount codes can increase participation, loyalty, and ultimately, profits. Missed this, or any of the Data Insight Series webinars? They can be found in the collection of Webinars available to Running USA members at RunningUSA.org. Looking forward to Data Insight Series No. 5? 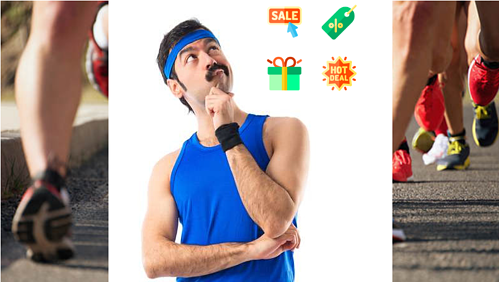 It will be held on in January and will reveal data around the usage of comp codes and 100% discounts in athletic events. Keep an eye on our Data Insight Series page for updates and new webinars!